Street Fighter has been around for more that thirty years, let that sink in for a moment and let it make you feel really old. Starting in 1987, there have been a tremendous amount of games and spin-offs since the original arcade game. 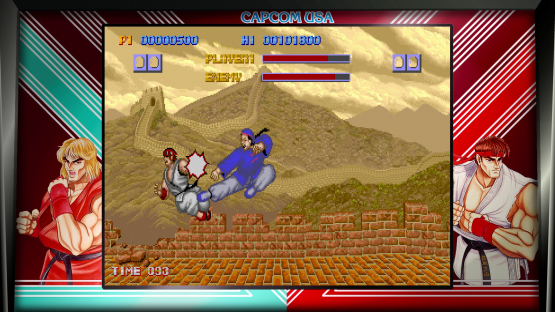 Capcom recently released, by means of a celebration, the Street Fighter 30th Anniversary Collection, a twelve game anthology of key titles from the series history in ‘arcade perfect’ forms with added online functionality. After fighting through the collection in a strange kind of fighting rite of passage, does the collection match the legacy? 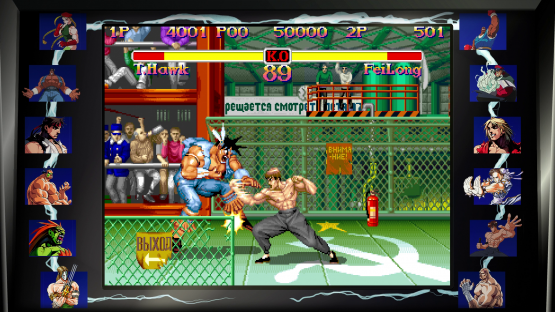 The gameplay is quintessentially the same between all of the twelve games, but there is a noticeable advancements and changes in the fundamental mechanics as the games progress. 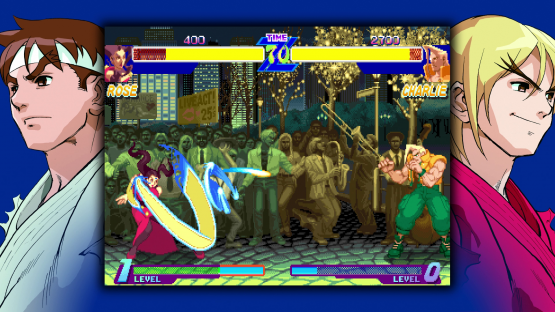 From Street Fighter II’s revolutionary combo system, to Street Fighter III’s bewilderingly deep ‘Parry’ system, it’s easy to see while playing this collection why the series is heralded as one of the greatest in its genre’s history. How smoothly the gameplay is for the player fundamentally depends on the game you’re playing; with the very first game feeling horribly unresponsive, and the later games feeling wonderfully smooth and player-friendly, if a little jarring at times with how different they are to play. One problem from a gameplay standpoint is an unfortunate lack in terms of selectable modes. As much as it was recently in vogue for Street Fighter games to not have an Arcade Mode, I would have liked there to be more than just that for most of the games on the collection. I appreciate the four that can be taken online having a Training Mode, but I found it irksome that I couldn’t jump into training to get a feel for how different some of the characters were between the iterations short of jumping into Arcade Mode. Also, a few extra modes such as Survival wouldn’t have gone amiss either. Speaking of online modes in the game, I’m not sure that the online of Street Fighter 30th Anniversary Collection has been handled overly well. Firstly, and perhaps most importantly, I need to address the games that were chosen to have online functionality. The fact that only four of the twelve games have online is galling, but the fact that one of those four is not Alpha 2 is practically insulting. Street Fighter III: 3rd Strike is one of the golden four, so that makes up for a lot of it, but there should have been more choice from a collection of games of this calibre. Ranked Modes in the collection allow you to pick your game and then simply enter a match, with a “best of three matches” set-up as standard. However, this only matches you to people around your skill level, meaning that you cannot choose to fight against those of a higher skill level. Although not a problem for those new to these games, it’s deeply frustrating to those familiar with the games that want good matches. The netcode in general across both this and the lobbies were slightly inconsistent with noticeable input lag at times, which is frustrating as the 3rd Strike: Online Edition felt far smoother online that this and that was released in 2011. The lobbies are set up in an interesting, if not particularly effective, way with the game being decided by vote. The players vote for the game they want to play of the four online-enabled games and it randomly selects the game from the choices. This does have the advantage of being able to break game deadlocks in which two players can’t decide on a game, and does give a slight variety to the lobbies in long sessions. However, the issue with the online lobbies is that the mode isn’t set up to allow options to be changed, such as match length and number of matches, so that all lobbies will play out in roughly the same fashion with no real player control over them. This being said, there is the option to add scan lines, which I personally find to be a wonderful little touch. One thing that no collection is complete without is the extras and, although the Street Fighter 30th Anniversary Collection has a lot of artwork and concept art from throughout the history of the franchise all archived, it does come across as a little lacklustre. The best of the extra content is the timeline that can be accessed that places all events in the Street Fighter franchise history in one place to browse through. There are a few issues with loading in these menus, with sometimes images not loading in at all, but this is a pretty pleasant walk down memory lane when it all works. The aesthetics of the game are a mixed bag, as one would expect with a collection of this magnitude. The earlier games have aged terribly as time has marched on with Street Fighter not only feeling clunky to play (as mentioned earlier) but looking horribly dated too. As you move through the games on the collection, however, the aesthetics improve and improve and you can easily begin to see why the series still stands as being so iconic amongst the fans of the fighting game genre. Also, the choice on the banners is weird in that it only gives you the option to have banners, black them out of not have them at all, the last of which makes some of these games look atrocious. This becomes very apparent in Street Fighter Alpha 2, 3 and Street Fighter III: 3rd Strike. These three games, specifically are my personal peak of the Street Fighter aesthetic and look incredible even by today’s standards. 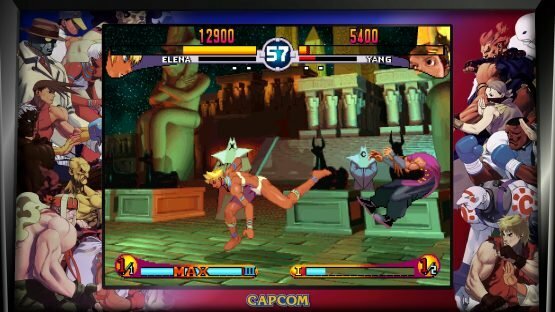 3rd Strike in particular is awe-inspiring in its fluidity of movement and the beauty in its animations. One thing that remains as consistent through the whole collection is the stage backgrounds, which are iconic in their own right for the most part and still look incredible now, with stages like Sanzaku Castle holding up really well. The character designs throughout of all of the twelve games is incredibly consistent, maybe (ironically) excluding Twelve. For a collection that has close to 50 playable characters in total, the sheer creativity in that roster is nothing short of impressive. Also, this collection stands a small testament to how great Capcom are at sprite work on their characters, especially in the Alpha series. After all, the fact that Ryu, Chun Li and others are instantly recognisable speaks volumes of just how well-designed they are as characters. 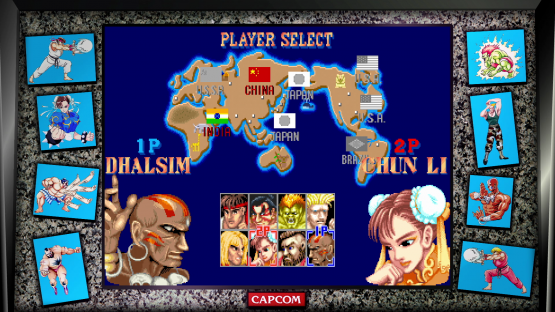 The music is, once again sadly excluding the original Street Fighter, impressively diverse and fantastically composed. From the score of Street Fighter II, composed by the legendary Yoko Shimomura to the hip-hop inspired score of the Street Fighter III series, the franchise has ticked a lot of musical genres off it’s list (leaving metal for Guilty Gear, and rightly so). Furthermore, should you want to, the tracks from all of the games on the collection can be found in the Extras and be listened to at any point. Whether I can recommend the Street Fighter 30th Anniversary Edition entirely depends on how much of a fan of the franchise you are. If you love the franchise but aren’t massively into playing the games seriously, this is a fantastic collection of legacy titles (even if missing a few important ones in my opinion) and a great way to have all of these games in a single, easy-to-navigate place. However, if you are into these games in any serious way, the lack of modes and inconsistent online works as a huge negative for the collection overall. A good collection of some of the best fighting games of all time, but held back by missing key titles from the Street Fighter legacy, and an arguable lack of care and attention that these games deserve.